As mankind stumbled through the 21st century, it began to reach out for greener pastures. After a number of early disasters, Astral Gate technology was perfected. Finally able to realistically approach the speed of light, the asteroid belt and beyond came within reach, and a new era of frontier expansion began. But just like in the Old West of the past, among the first to head out are the dregs of society: crooks, drug pushers, hackers, and so on. At the same time, however, there was also another type of person: one who roamed the ranges looking for whatever was there to take. Taking another page from the Old West, they called themselves Cowboys. The year is now 2071, and the Cowboys are out on the range. Cowboy Bebop is the story of the Cowboy starship Bebop as it be-bops its way through the solar system, hunting heads and making do in the wild reaches of space where anything can happen. 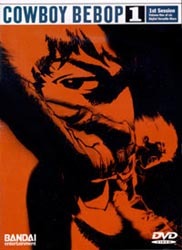 Inspired by the free-wheeling style of Minston's Play House , a 1940's Harlem nightclub where Jazz players dueled each other with no regard for the rules of the times, Cowboy Bebop literally swings its way from mood to mood and adventure to adventure. It is a wild ride where jokes fly as well as lead, pretty faces can be hidden behind an ugly mug, and help and harm can come where you least expect it. Cowboy Bebop is an animated film noir, first and last. It is the dark, rim, cynical, blackly humorous, morally ambiguous tale of four people struggling against uncaring meaningless random fate, in a situation they did not create; it's also the story of one man who is doomed to die because of his past. It's easy to imagine these characters dropped into "The Maltese Falcon" except for wardrobe--and the more I think about it, the more perfectly they fit. Even the overall look of the series has lots of darkness, lots of contrast, like those old films did. Likewise, Cowboy Bebop is also one long love letter to John Woo. The harsh lighting, the frantic pace of the martial arts sequences and gun battles, the action scenes that would have been insanely dangerous to do with flesh-and-blood stuntmen, the body count, the pacing, the timing. For example, the gun battle in the cathedral from Episode 5, "Ballad of Fallen Angels," is obviously borrowed respectfully from John Woo's 1989 film "The Killer." And then there's the repeated bird imagery. Lastly, I think I see more than a little of "Lupin III" in Cowboy Bebop, in the cynical humor and, especially, the character design. Femme fatale Faye Valentine is femme fatale Mine Fujiko (albeit with purple hair and wardrobe apparently borrowed from the Dirty Pair) to wisecracking daredevil Spike Spiegel's wisecracking daredevil Lupin. Jet Black bears more than a passing resemblance to Jigen as well, though he's older, beefier, and not as snappy a dresser (note how strong the resemblance is, though, when Jet Black puts on the fedora in Episode 23, "Brain Scratch"). I could attempt to stretch a point by claiming that Vicious was based on Goemon, but there's not really much those two characters have in common other than an idiosyncratic fondness for edged weapons. There are other influences too--spaghetti westerns (though maybe it's more a case of film noir influencing both spaghetti westerns and this series), Bruce Lee movies, blaxploitation. Episode 11, "Toys in the Attic," is clearly a gentle parody of Ridley Scott's "Alien." And so on. The above description came from just some guy, and was edited by yours truly (contact me). Cowboy Bebop takes us to the time of 2071, where space travel is commonplace and getting to Mars is just as easy as your common road trip. Gate technology has made the colonization of other worlds possible, enabling mankind to spread out and settle on the other planets and moons of our Solar System. However, with the expansion to other worlds also comes the growing rate of crime, which has gotten to the point where even law enforcement needs the extra help. That's where Bounty hunters (or "Cowboys") come in. Cowboy Bebop is about the many adventures and unique oddessies of the crew of the Bebop, a group of bounty hunters just trying to make ends meet. The laid-back Spike Spiegal (a former crime syndicate member), former police officer and owner of the Bebop, Jet Black, the beautiful gambling addict Faye Valentine, the incredibly quirky and eccentric young hacker Ed, and the intelligent "data dog" Ein all make up this crew of cowboys, all trying their best to capture that next bounty (and hopefully put some food on the table as well).